Gravel cycling has been hot of late and so there has been a flurry of activity from several companies looking to take advantage of this style of riding. This bike from Noble Bikes may seem like one of those kinds of moves to hop on the wagon and make hay while the gettin’ is good. 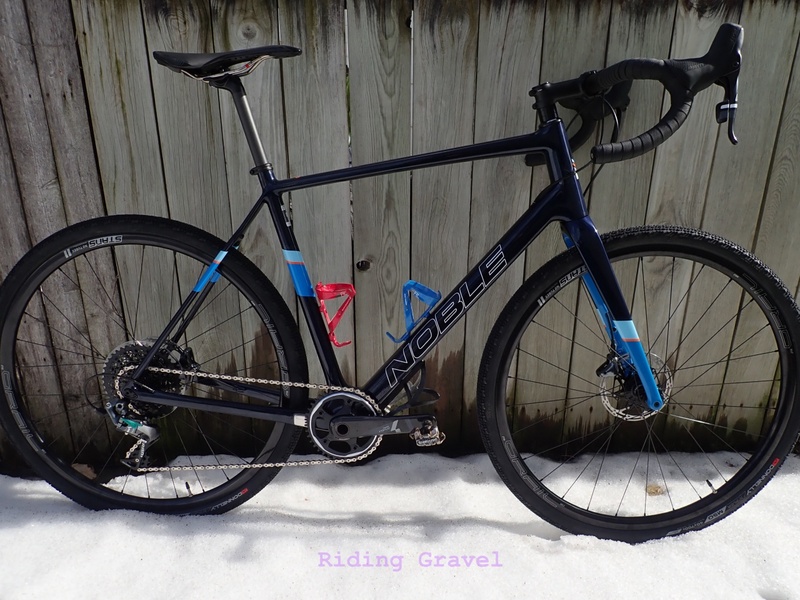 However; that isn’t the case here, and this is a serious entry into the gravel cycling market that has some pedigree, although it is not immediately apparent. To properly understand the brand and this particular bike, it might prove useful to have a look at the history behind the GX5. The bike is really an evolution of ideas formed in 2012. The brand’s owner, Mark Landsaat, was employed by Raleigh at that point and Mark played a major role in the design and development of the Raleigh Tamland. 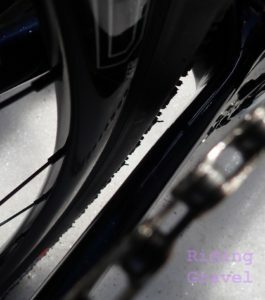 (Click here for my “Gravel Grinder News” era Tamland Two review.) Since then, Mark has left to start out from scratch with his own brand with a partner. They have been working on a evolution of the ideas presented in the Tamland and the result is the new Noble Bikes GX5. So, this isn’t an “off the shelf”, carbon catalog bike. This bike has some very tried and true ideas behind it along with an application of modern technologies. Let’s take a closer look….. 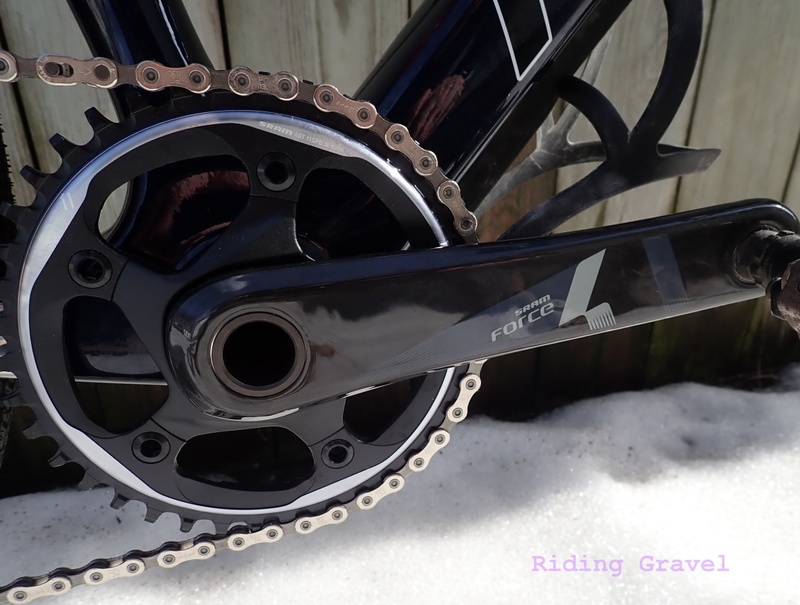 The GX5 sports SRAM Force 1 mechanical shifting. What It Is: The GX5 is carbon fiber, of course, and has the latest in technology including internally routed cables, electronic shift routing capabilities, through axles front and rear, and flat mount brakes. However; there are some things old and some things new with the geometry here that bear mentioning. The basics from the Tamland were carried over- The low, size specific bottom bracket drop, (ranges from 80.5 on the small end to 72.5mm on the largest size), the slack-ish head angle, size specific again from 70.0°-71.5°, and the long fork offset which is 52mm for all sizes. The “new” has to do with Mark’s “Forward Geometry”. This pairs a longer top tube with a shorter stem to move the rider’s weight forward a bit in relation to the bike. Of course, tire clearances are increased over a road bike with the stock set up being a 40mm Donnelly MSO which is tubeless ready, by the way. Noble lists a 40mm as being maximum for tire size, but I bet you could squeeze in something like a 42mm width tire in here for dry course riding. There are hidden fender mounts, by the way, and rack mounts also are provided. While 40mm (shown here) is considered max tire clearance, it looks like there is room for more. But, that isn’t to say that this is a bikepacking rig, it really is a “go-fast” gravel travel machine. The Noble GX5 sent to us to review is a size 58cm and without pedals it weighed in at 19.55lbs with tubes in the tires. That may not win any awards for the lightest gravel travel sled, but it isn’t anything to sneeze at either. The wheels are Stan’s Grail MK3 hoops laced to Stan’s hubs, so lighter wheels certainly exist. (Stan’s claims 1675 grams for this wheel set) There are also some other bits and baubles one could replace to bring the weight down further, but as it stands, this is definitely a racy weight and not a heavyweight brawler by any stretch. First Impressions: Noble Bikes is direct to consumer, and as such, I think it bears mentioning here about how the bike was packaged and how it went together. The bike comes double boxed, which is a rarity for any company to do. The bike is very well packed inside, and it will take the average person far longer to free the GX5 from its mummification than it will to assemble it. Handle bars, front wheel, and front brake caliper mounting are all that is really necessary to do, along with the seat post insertion. Adjustments were few. The only tricky part being the setting up of front brake clearance, and that isn’t all that hard to do. Noble provides a slick assembly video on their site if you need any guidance here. The X-Sync ring is a 40T here. There are no provisions for a cable operated front derailleur on the bike. The bike, once assembled, is a handsome rig with its rich, blue color and tasteful graphics. The SRAM Force rear derailleur matches the scheme well. Speaking of the drive train, you get a 1X set up here with a 10 – 42T 11 speed cassette and a 40T X-Sync front chain ring. Shifting is one sided with the SRAM Force brake/shift lever and the left side lever is brake only. Those are Force calipers in the hydraulic flavor working on those 160mm rotors, by the way. All of these bits were perfect straight out of the box and so far during my “getting to know you” rides I haven’t had any issues with stopping or shifting. While I am not inclined toward a 1X drive train personally, (I use doubles with 46/36T chain rings), I could be swayed otherwise. That said, there are no provisions for a front derailleur on the Noble GX5, although I suppose an electronically controlled one, like a SRAM wireless type, might be possible here. Either way, that’s a bold move on Noble’s part. 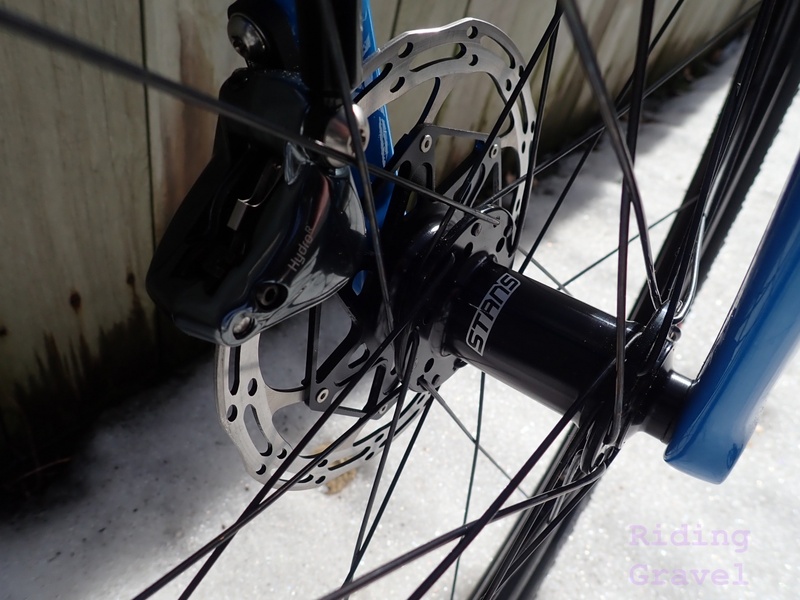 Hydraulic, flat mount brakes, two piece rotors, and Stan’s through axle rims here. In terms of the frame, it is an amazing piece of carbon fiber engineering. While there is a Press Fit bottom bracket, it appears to be one of the screw-together types, so that would be better than the original Press Fit offerings, if true. The headset is internal, of course, and the frame ports are tidy and unobtrusive. There is no port for anything but the rear brake and rear derailleur. The rear stays are wide and flattened for compliance and the carbon shafted seat post all work together to give the GX5 a really smooth ride. That blue paint looks great in the sun, doesn’t it? The GX5 cuts a very similar profile to the old Tamland Two I have. Both have a sloping top tube, a fair amount of seat post extension, and both have similar geometry. Therefore; the ride quality and handling aspects of the GX5 weren’t alien to me. It felt like “old home week” but different. That difference was the stiffness of the bottom bracket, the lower weight, and the sound of the bike. Carbon bikes just have a unique sound when ridden versus metal framed bikes. So Far…… The Noble GX 5 is not a bike or brand you would think of as having a history in gravel bike design, but in fact, they do. It shows up in the geometry and details that the GX5 has. All that doesn’t mean a thing though if it doesn’t look good and ride well, both things the GX5 has done so far. With a design that does not support a front derailleur, the GX5 is bold and uncompromising in its purpose. How that plays out as we get this rig onto the gravel roads will be seen in our next “Checkpoint” update coming in a few weeks or so. 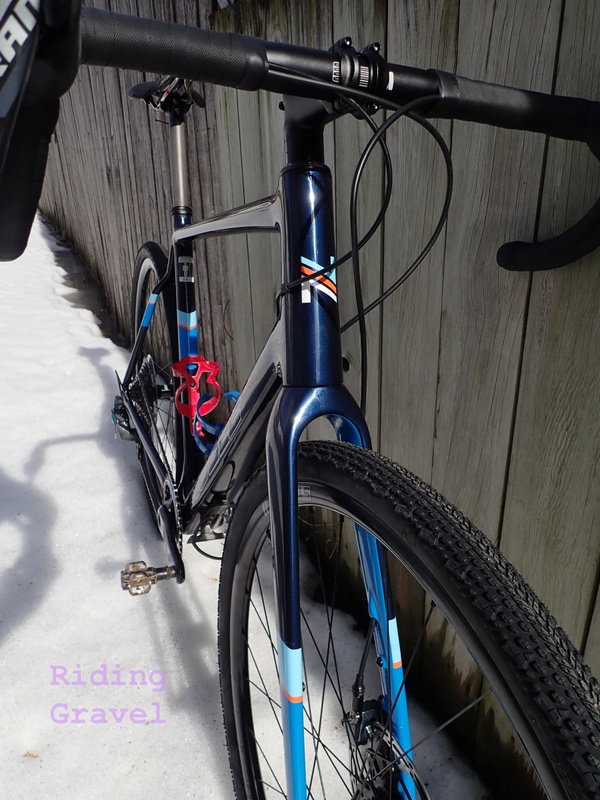 Note: Noble Bikes sent the GX5 over for test and review at no charge to riding Gravel. We were not paid, nor bribed for this review and we strive to give our honest thoughts and opinions throughout. This quote from their web site sure seems like marketing BS. Their bikes don’t have longer top tubes, at least appreciably, and if they did and you were to pair the bike with a shorter stem, how does that “shift the rider weight forward”? Sorry to hear you feel that forward geometry is marketing BS. It certainly isn’t intended as such. While you may feel that the bikes do not have longer top tubes, I believe you will have a difficult time finding comparable bikes with similar top tube lengths. As an example, our 54cm sized frame has a 555mm effective top tube length. I believe that you will find that many brands run 540mm or 545mm on 54cm sized bikes. that may not be a huge difference, but it’s certainly on the longer end of the spectrum. With geometry small differences can have a significant impact on handling. I was fortunate enough to have a bike with existing geometry and a steel prototype with forward geometry so we could ride both bikes back to back. Based on my opinion the bike with the new geometry was the better handling bike off road. The difference was subtle, but when riding bikes back to back could be noticed. The feedback is welcome and we may have to word it differently, it’s not so easy to come up with descriptions that accurately describe the change you would feel when riding the bike. As a side note, one of the benefits of forward geometry is especially noticeable in smaller sizes. Because we run slightly longer top tubes, we can run better seat and head angles will still avoiding toe overlap with the front wheel. The longer top tube pushes the front wheel away from the BB increasing front center. If you have any other questions regarding the GX5, please feel free to respond on this thread, and I will do my best to reply. The ad box keeps shifting the text of story as it cycles through different sized ads. Is it just me? A longer toptube+shorter stem, will shift the riders weight BACKWARD not forward! Hi Slim, yes you are correct, the copy on our website is wrong. I will make sure this will be corrected. Sorry about that. @Mark Landsaat – is it true that a front derailleur will not work on this frame? If so that is a shame. 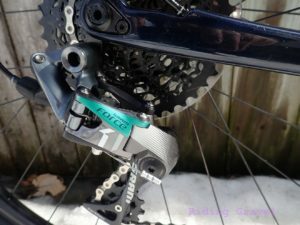 I have tried 1x drivetrains and they don’t work for me and how I use a gravel bike. I was interested in this bike, especially if you started selling frames, but that would completely knock it out of my consideration set. @Aaron Fader- hello! Since I’ve already asked Mark these questions, I have had answers from him I can share. First, yes- this frame was meant to be 1X, although it is possible to mount a SRAM electronic front derailleur on the current offering. There will be a front derailleur compatible version of the GX5 in the future as well. Noble is working on it, but since they are a smaller company, these things take time to roll out. I do not know what the planned ETA is. @Aaron Fader, Hi Aaron GT already replied to this and he is correct, but I wanted to fill in some more details. I developed this frame in both a 1x and a 2x version and as mentioned by Guitar Ted, I have not been able to roll out the 2x version yet. I fully realize that 1x is not for everyone and we have plans to release frame sets in the future. Being a one person startup with some help from industry friends I can’t move as quickly as I would like (this stuff is expensive). My best recommendation at this point is to continue to watch the review since the 2x version of this frame has identical geometry and will have the same handling. I wish I could give a more accurate time on when we will have this available, but it depends on when I can finance the next order. Even though you are not interested in a 1x version, It’s exciting to hear you are interested in the GX5. My Kona Rove NRB has a 378mm reach paired with a 50cm seat tube, so the GX5 is not the longest of the long. I have a long upper body compared to leg length. It is difficult to find a “gravel” or “endurance” bike that doesn’t feel like the handlebars are where my belt buckle usually is. Glad to see a bike with breathing room up front. A longer top tube should add compliance and a more stable ride.